Many congratulations to The Savoy, one of world’s iconic hotels, which has won the European Hospitality Awards Green Hotel of the Year. As Green Hotel of the Year sponsor, SaveMoneyCutCarbon was delighted to hear the winning announcement on Friday night at the Intercontinental Hotel on Park Lane. We had a wonderful gala dinner, and I was particularly happy to present the award to Jack Harding, Director of Engineering and Debra Patterson, Sustainability Manager of The Savoy. Heartfelt thanks to Natasha Raynor, Forum and Awards Director at Arena International Events Group, who organised a very memorable evening in London. The Savoy is continuing to demonstrate how hotels can save money and cut carbon footprint since its ambitious and successful £100 million restoration. The three-year project had green strategies at its heart, while ensuring that guest satisfaction was unaffected by the energy and water-saving innovations. We were also very pleased to act as host to Andrea Nicholas, Director Green Tourism, Ben Reed, Project Sales Manager of Hansgrohe in UK, Oliver Bryant, who heads the Hospitality Division at Philips Lighting and Robert Kenworthy, Operations Director at Ralph Trustees. Being green with a commercial focus is more important now than ever in the hospitality sector and all our guests are working in different ways to deploy or provide energy and water-saving solutions. We will continue to work with them and provide end-to-end services that deliver savings year-on-year for hotels. Please do contact us to discuss your company’s green strategies on 0845 123 5464 or email us to start the conversation. You can read more about the ways that we have saved hotels hundreds of thousands of pounds through our unique service here. Best Technology Category saw a Special Commendation go to Rotana Hotels. Rolf Schmidt, Managing Director of TOPHOTELPROJECTS GmbH. 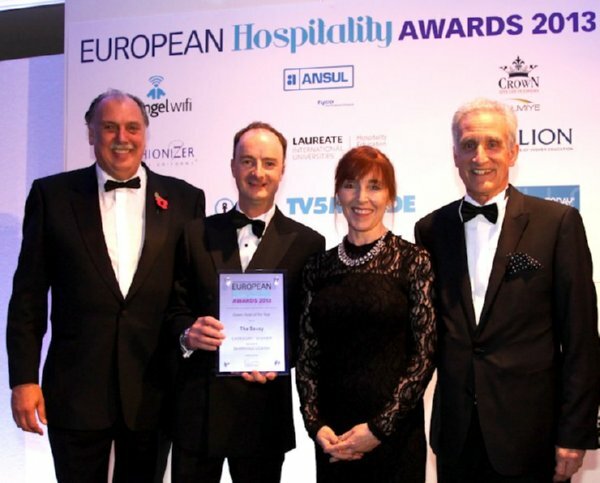 We’re already looking forward to the European Hospitality Awards 2014 but contact us on 0845 123 5464 if you have any questions and feel free to share the good hospitality news with your colleagues and contacts.